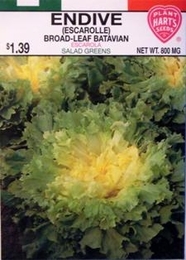 A favorite salad variety with wide leaves with cut, irregular edges. Inner leaves blanch nicely to a creamy white. While this variety can be blanched and eaten as a salad green, it is usually cooked like spinach or is used for flavoring soups, stews and sauces. Rich in vitamins A and C. Blanch by tying outer leaves together three weeks before harvest. 18000 Seeds/oz. Plant 1oz per 100ft row. 4lbs of Endive seed needed per acre, 1lb needed per acre if using transplants.